On April 19, we commemorate the 100th anniversary of the 1911 Grand Rapids Furniture Workers Strike. This historic event is not only a little known event in the struggle for justice in Grand Rapids, it is an event that has valuable lessons for how we see struggle against economic and political power today. The 1911 furniture workers strike did not happen in a vacuum, since workers had been organizing for decades and the business community had created the conditions for such a strike by amassing tremendous wealth and power. Grand Rapids workers were in some ways ahead of much of the country in terms of labor organizing and class-consciousness. 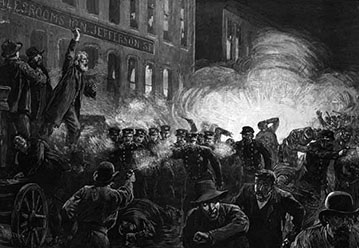 The radical labor group, the Knights of Labor (KOL), began organizing in Grand Rapids in 1883 and were influential in getting Grand Rapids to be one of the first cities to celebrate May Day after the 1886 Haymarket Uprising. The KOL also got members elected to the Grand Rapids City Commission at the end of the 19th Century and early part of the 20th Century. At the same time the workers were organizing the local business elites were also working on ways to generate more wealth and political control throughout the city. The furniture company owners were a tight knit group that employed about one-third of the workforce in the early part of the 20th Century and had begun their own Furniture Manufacturers Association in 1881 followed by an Employers Association in 1905 that had informational cards on every worker in the furniture industry. In addition, the furniture robber barons had also begun to control a great deal of the local banks and interlocking systems of control within the furniture industry with owners sitting other boards of directors of each others companies, according to Jeffrey Kleiman’s book Strike! 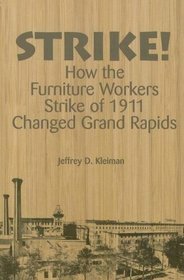 : How the Furniture Workers Strike of 1911 Changed Grand Rapids. In fact, the interlocking system of factory owners and the local banking system was so significant that in the 1920s they were under investigation for violation of the Sherman and Clayton anti-trust acts. The unbridled wealth of the furniture barons and the growing labor unrest around the country that was fighting for an 8 hour work day, better wages, better working conditions and the right to unionize was the perfect context for a massive strike in the spring of 1911. There are discrepancies over the actual number of workers who went on strike, but most historians seem to put the number at 4,000 initially and as many as 7,200 by the end of the 4 month strike. Workers collectively walked off the job on April 19, 1911 in protest against the furniture owners’ lack of response to worker demands. April 19 was also the day after the Furniture Manufacturers Association had published a response to the workers says that they would not agree to collective bargaining. The strike spread fast and included the support of the Mayor George Ellis and the Catholic Church under the leadership of Bishop Schrembs. Eventually the furniture owners brought in strike-breakers (scabs) to try to keep the factories open and producing. Conflicts occurred between workers on strike and scabs with some documented evidence of violent confrontation and cases where the wives of the striking workers threw rocks at the scabs when coming out of the factories. Another important aspect of the strike was that the workers were from a diverse ethnic background, which included German, Polish and Scandinavian workers. In fact, the only ethnic group that did not participate in the strike was the Dutch workers who were pretty much told by the Christian Reformed Church to not participate in the strike. You can see from this Grand Rapids Herald headline that the CRC demanded that Dutch workers quit unions. The Strike eventually ended in August with only some of the workers getting their jobs back and few gains made in the workplace. However, the strike did pave the way for worker improvements and future union organizing campaigns in Grand Rapids. At the same time the furniture owners also took stock in the lessons learned from the 1911 strike and made some of their own strategic decisions. The elites in the city were not happy with the role that Mayor Ellis played in the strike and they set their sites on not only electing people who would be more pro-business, they decided to alter the very nature of city politics. One thing that disturbed the furniture owners and bankers was the fact that the Grand Rapids City Council was too responsive to the demands of their working class constituents. At the time of the 1911 strike the city was divided into 10 wards, with most of the wards representing specific ethnic groups. Each ward had one commissioner and those commissioners tended to support the ethnic workers during the strike. The elites in the city decided that democracy was unacceptable so they pushed to have a city charter revue commission. This commission eventually recommended that the city be restructured to have a 3-ward system, with 2 commissioners representing each ward. The new city charter was adopted in 1916 and has remained the same since in terms of the ward structure for Grand Rapids. Looking back on this history can certainly shed light on how the current economic and political climate impacts worker and democratic struggles. Within the last few years there has been a greater push by the local business elites to demand from the City government greater concessions for their pet projects and economic investments. One only has to look downtown to see who is behind the building projects, but what is less known is how much these projects have received in tax abatements and subsidies. The long-term benefits of these massive taxpayer supported projects will primarily benefit a small sector of the population while working class people become further marginalized. The 2008 economic crash widened the growing gap between the haves and have not’s with more and more Grand Rapids residents becoming unemployed, under-employed and living in poverty. In recent years the City’s budget problems have translated in part to an attack on public employees, manifested in the elimination of jobs and the reduction of health and pension benefits. This push to undermine the public sector unions has been exacerbated by the state policies that Michigan Governor Snyder has also imposed since taking office in January. The policies of Snyder have been met with support from Grand Rapids elected officials who have embraced the Governor’s tax revenue incentives. In addition, a local group of economic elites has been organizing in recent years in order to alter the political process in West Michigan. The West Michigan Policy Forum has its own set of goals for the region and the state, with several of the policies they have recommended already being adopted by Governor Snyder. Lastly, the same group of elites has been meeting in private to propose a new form of local government. The group calls itself the One Kent Coalition and is following in the footsteps of the furniture barons of 100 years ago who sought to change the political structure of Grand Rapids through money. It is indeed true that those of fail to learn from history are doomed to repeat it. We can all learn from the 1911 furniture workers strike and apply some of those lessons today. We can either embrace solidarity and justice as our guiding principles or we can allow the economic elites to determine the future of our community. The choice is ours! I can remember that my father who had been unemployed for nearly 18 months (in the 1950’s)got a decent job because of a union contact. His church told him that joining a union and working on Sundays was against God’s will and the doctrine of the church and that he must quit his job. He did the smart thing and quit the church. Nearly 4 decades after the 1911 Strike, old attitudes hung on.Thank God for unions! Thanks for publishing this, Jeff. Thanks for your comments. Wow, in the 1950s they were still arguing that unions were against God’s will. Was your father a member of the CRC? My father was a member of the Protestant Reformed Church at the time. During the 1980s, I attended a Bible Study led by a CRC member who was still advocating that “To go on strike would be to go against God’s will”. WE were going to be voting on a work stoppage shortly after. Several of us never went back. Matthew, I am pretty sure it was from the Grand Rapids Herald.